Kustermans Berry Farm has it all! Fresh blueberries, raspberries, corn, pumpkins and seasonal produce. The Market offers fresh baked goods, ice cream and thirst-quenching drinks, sandwiches and salads. There are many gifts and kitchen gadgets to choose from too! 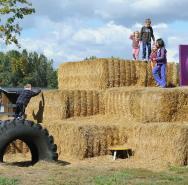 For the Kids, The Straw Bale Adventure, friendly farm animals, pedal karts and farm tours!